For the longest time, until my early twenties, I didn't know what a chicharo was. I actually didn't know much about beans, for that matter. Yes, I know it may sound strange that this Cubanita didn't know much about beans, but it wasn't until I started dating my husband and family that I learned the power of the bean, and of bean soups. Seriously, it's because of that threat that your mom gives you before you visit a friend's house that I finally started to eat Cuban food. You know the line I'm talking about. The one about making sure you don't embarrass your family by being rude and not eating what is placed in front of you when you're a guest at someone's house. Not only did I have my mom's words running through my head each time I'd sit down to a plate of ropa vieja, carne con papas, arroz con pollo or any other Cuban plate made by one of my husband's family elders, but I also had the story of what happened to Mike during one such dinner. Mike is a friend of my husband's cousin (keep up, only three people involved in those eight words). Mike was over for dinner one night and my husband's aunt served him a plate of food. Mike was raised by a smart mom and he, too, had the "don't be rude and eat everything" mantra going on in his head as a guest in his friend's home. So, like a good guest, he ate everything on his plate so quickly, that my husband's aunt asked him if he wanted a second plate. Non-rude Mike said yes, and he ate the second helping quietly. This went on for plates and plates (it's a Cuban story, so maybe it was only two plates - max three - but no one will ever know the truth). Mike finally had to leave and go home. To the bathroom. To return all the food he had wolfed down in an effort to not be a bad guest. The worst part? My husband's family was witness to all this and to this day, whenever Mike is in town visiting, we hear how he's such a good, non-rude guest that ate and ate and ate - and threw up. So, one day, my husband's other aunt, Bivi, made one of her bean soup dishes and I was forced to face the bean. And I loved it. I think it must have been a big plate of Judias (white beans) with rice that I was served, and I was hooked. 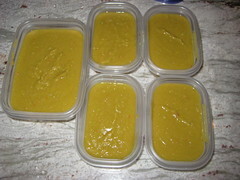 And anytime, to this day, that Bivi makes soup, I try my best to swipe a container and bring it home for the week. And, that's how I learned what a Chicharo (Split Pea) was and for years, I've made my own sopa de chicharos in a slow cooker, foolproof, all day long, with ease. But now, since Nitza doesn't do slow cooker, it was time to make real chicharos, Cuban style. The title is really split-pea puree, but we refer to it as sopa de chicharos or just plain chicharos. Apparently, there's a myth out there (but some swear it's true) that when you make chicharos, you can't make them in a pressure cooker because the chicharos clog up the pressure cooker exhaust and it can cause the lid to explode off. 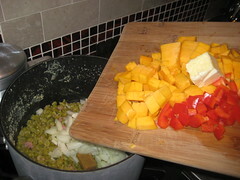 I've heard that story before, but since Nitza makes no mention of the pressure cooker, I go old-school with the cazuela. It's easy, and if I would know how to buy calabaza (pumpkin or squash) that would have been ripe and ready to eat, it would have been easier. I guess the calabaza I chose was too green and there was no softening it. I must have cooked that soup for four hours. 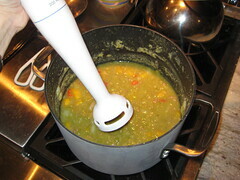 Four hours of cooking plus an overnight of soaking the split-peas even before getting started. No quickie meals here. My friend, Adrian, recently explained why this cookbook was called Cocina al Minuto and that it had nothing to do with Cooking in a Minute. He explained that it was really named after the French-style of cooking, A la minute, which the website, Practically Edible, defines as: an expression used to describe a dish that is prepared right away when you order it. Short-order cooking. Really? The recipes in this book are meant to be cooked when someone orders a dish? You better have good bread and wine at your restaurant if you're cooking this way. Your guests will be waiting for over an hour, at least, for anything. Even for a sandwich at my rate. But, again, I stress that this recipe is an easy one. 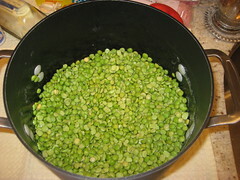 Once you throw out the water the split-peas soaked in overnight, you place them in a cazuela and cover them with cold water and ground ham. 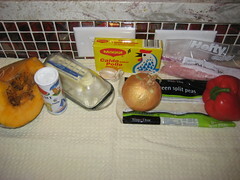 You cook the peas until tender and then you add: a cubito Maggi (boullion cube), a small chopped onion, half a red pepper, a cup of calabaza, butter and salt over low heat until the calabaza is tender - good luck! I then took my hand blender and osterized it 'til silky smooth. It was awesome. I ate it for days and those that tried it loved it. My kids? Well, my kids didn't try it, though. Maybe I should send them to my husband's aunt home, along with the mantra, so they could learn. I sure hope it doesn't take them twenty years to see what they're missing. Made it many times but chicharos are the only bean that don't require overnight soaking. I also add potatoes and chorizo. Yummy!